What is the last thing to go through your mind before you actually shoot the ball? Have you ever wondered? When we become a little further advanced in the game, our pre- and post-shot routines and actions become largely subconscious, and so we often “just shoot” without thinking of what exactly we’re doing—and this can be a good thing. It means that what used to be a hodgepodge of steps preparing for a shot—the lining up, stepping into the shot, and so on—has become comfortable enough that we do it automatically. The problem with this nonthinking, however, is that now and then bad habits creep in and spoil what we used to do fairly easily, and because we’re just not thinking too in depth about what we’re doing, we are often unaware that a bad habit has developed. What to do? Answer the question I have posed. Set up the shot in the diagram and check for yourself. All you have to do is play the one ball in the corner and then play position for the two in the opposite corner. Do what you would normally do—look at the angles, line up—but right before you take that final backswing, try to determine what you’re thinking Maybe the last thing to go through your mind is the aiming point on the object ball; maybe it’s the English you’re using; maybe it’s the movement of your eyes. You may even find that you’re thinking nothing at all. After you’ve done this, set up the shot again. Now, go through your normal routine and get down on the ball and prepare. When you’re ready to shoot the ball, this is what I want you to think: as you take your final backswing, ask yourself, “Is my grip relaxed?” That’s it. If your grip is nice and relaxed, then go ahead and shoot. See what happens. Whenever I am in competition or practicing, my final thought before I fire is always on my grip. Why? Errors often occur due to stroke delivery, not mis-aiming. Typically, we know where to aim. We take pains (or we should) to line up our whole bodies with the “line of the shot,” or the path the cue ball must take to contact the aiming point of the object ball. The problem usually comes in the delivery. If we are nervous or uneasy because of the difficulty of the shot, our grips tighten and prevent a pure backswing and follow through. In fact, on my final backswing, it is really only my thumb and index finger holding the cue; the other fingers may lightly touch for balance, but they must be loose enough to get out of the way of the cue. If my middle, ring, or pinky fingers are too tight, the shot will almost certainly be thrown off because those back fingers will actually pull my whole cue up and then push it back down on the follow through; if they are nice and relaxed, however, the cue will follow a much leveler course and smoothly run back and forth along the line I have aimed. Think about when we take practice strokes: they are short, sometimes very short, and so do not mimic the full stroke that we must apply when we finally shoot. If our grip is even a little tight, our practice strokes, which require little movement, will not be much affected; however, our final, bigger, stroke, which takes our arm through a fuller range of motion, will be affected, and the cue will actually be pulled out of alignment. When you aren’t thinking, you don’t even notice it. Instead, you miss and think you aimed incorrectly. Probably not. So I challenge you: take twenty minutes of practice time and just throw out some balls. Shoot shots that are both easy and difficult, and make sure the last thought that crosses your mind is a question, “Is my grip relaxed?” Then shoot the ball. Do this on every shot. 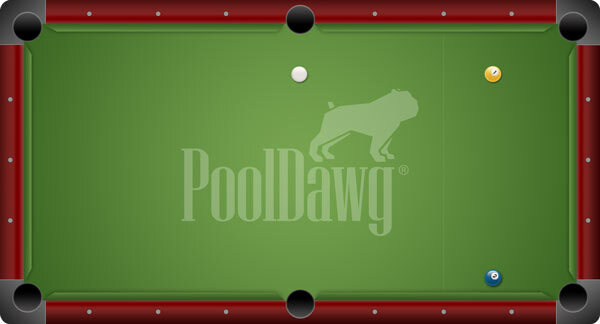 If you make this a conscious effort, I think you will see a promising improvement in your pocketing skills—particularly during moments of pressure—because your hand will stop getting in your cue’s way.